Back when smoking meat was legal in California, Lucille Buchanan (founder), started Lucille’s Smokehouse BBQ in Long Beach (In approx. 1942). As a native Southern Californian, I grew up thinking of Lucille’s as the best BBQ ever. I’ve grown up to reduce expectations, as sadly we have to do with most things, and found out that it’s not the best. But if you can’t have the best, Lucille’s is a damn close second. Taking my first plunge into the burger, I was smacked in the jaw by the most delightfully tasting mushrooms I have ever had. The combination of the portobello and button mushrooms gave a hop-scotch sensation whilst trading flavorful blows. The bun perfectly touches your senses, along with the shoestring onion rings, followed by the garlic mayo (aioli) sauce. The angus comes in as strong as an angus patty can come, and is complimented by the caramelized onions and then the mushrooms yet again. However this time, the jack cheese is right there putting a little kick on the end of the first battle. All it does is leaves you wanting that next bite, time and time again. Although typically my preference lies with other meats than angus, this had to be the best I’ve had to date. Hands down, it was at least cooked perfectly. Super-juicy, super-flavorful- I couldn’t get enough… I had a difficult time putting the burger down, as usual, however during the time-out’s, I was happy enough to spend the time tasting the fries. And they were pretty good; deep-fried and covered in a seasoned blend. Not the most amazing fries you’ll ever taste, yet very good nonetheless. Now when I finished my meal, I wanted more. The half-pound was clearly not actually a half-pound. I’ve had many burgers in my day thus far, and never have I had my beef-patty gone with 1/4 of the bun left there by itself. It looked so sad, lying on the clean plate, all alone, just wanting someone to pay attention and complete it. Obviously, cost-cutting measures are in effect, but that’s not alright when I’m paying as much as I did for a full meal. Overall the burger was great, but ended too quickly along with the fries. Thus, sliding in at #8 on THE Burger List, as well as #8 ranking on the $10 & Over (OC) list, Lucille’s Smokehouse BBQ’s Mushroom Burger. Note: Actual ranking is subject to change when new burgers make the list. Also, the percentage score will not reflect the burgers’ ranking on the list, for each burger is unique and must be graded on it’s own merits. 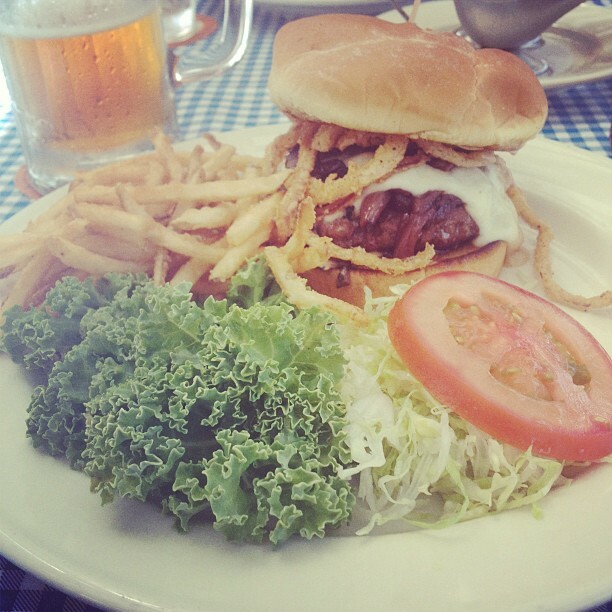 For up-to-date rankings, check THE Burger List in the menu! Thanks. If you’re interested feel free to shoot me an email. I look forward to hearing from you! Excellent blog by the way! to start my own blog in the near future but I’m having a hard time deciding between BlogEngine/Wordpress/B2evolution and Drupal. The reason I ask is because your design seems different then most blogs and I’m looking for something completely unique. Of course, and no worries! I’m using wordpress.